I've mentioned before that Alex and I don't go out too much and when we celebrate holidays and events, it always revolves around delicious meals that we share together. 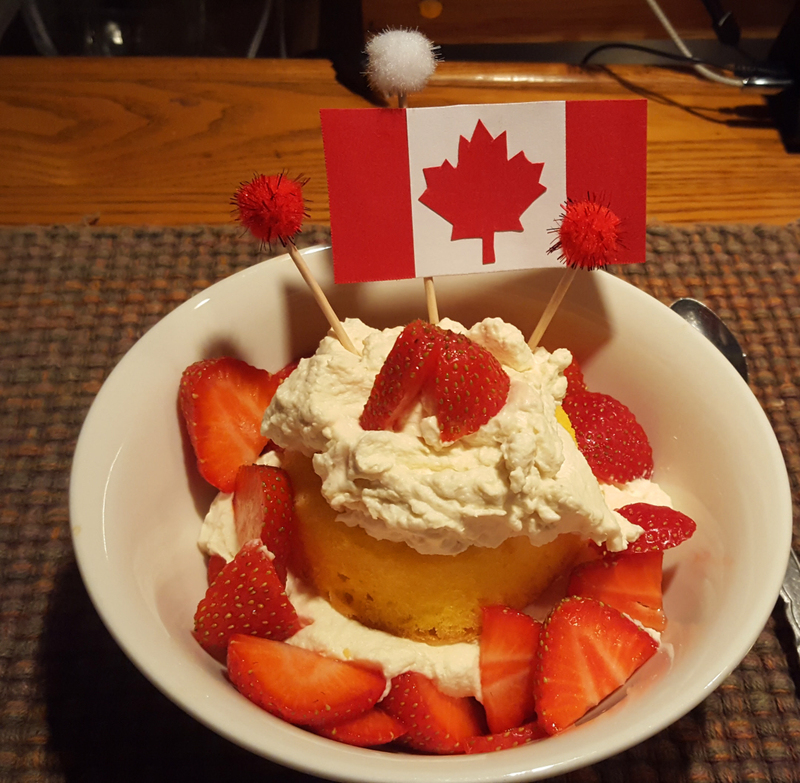 For Canada Day, I decided to have a day of appetizers! 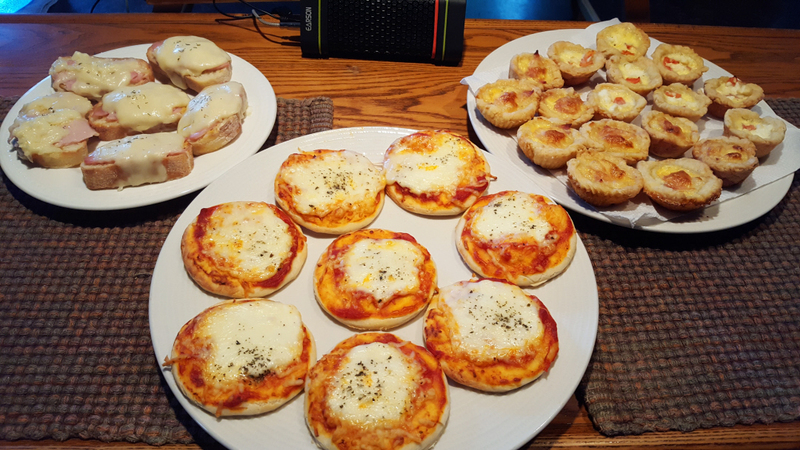 For lunch, I made Mini Croque Monsieurs, mini pizzas (red and white!) and Mini Quiches. The quiches were ham and Cheddar; and tomato and Feta. The Croque Monsieurs are DIVINE. For the pizzas, I made my usual thin crust Basic Pan Pizza Dough, and after pre-cooking it for a minute or so, used a cookie cutter to form the circles. The topping is just pizza sauce, fresh Mozzarella, a little Parm and some basil. It was pouring rain on Canada Day, so we stayed indoors. I don't know what we were thinking...but we decided to give all four dogs a bath. This is the aftermath! They even pulled down the shower curtain lol...sore backs prevailed. But now they all smell like oranges until they dirty themselves all up again! We definitely deserved a cocktail after that! 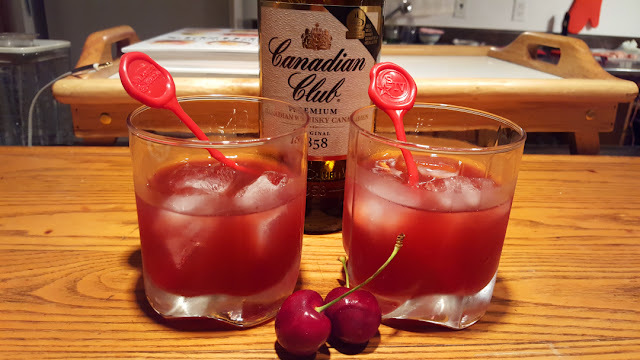 Alex made some cherry Old Fashioned's with Canadian Whisky. I bought a bag of fresh sweet cherries with the intention of doing some kind of drink, and he came up with this one. It was so good! I got the idea originally from this recipe: Bourbon Cherry Old Fashioned's. But we wanted to try Canadian whisky (Canada Day of course!) and Alex added different bitters and sweeteners...very tasty! With our cocktails, we had more appetizers before dinner. 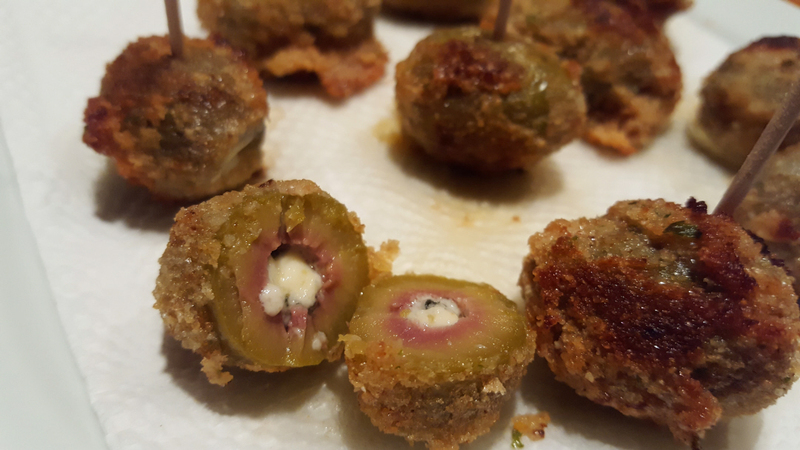 I made Fried Stuffed Olives, the recipe called for "deep fried"...I fried them in a pan with butter, so they didn't get that full-on deep fry look, but they were delicious! I stuffed each olive with Blue cheese. Wow is all I can say! 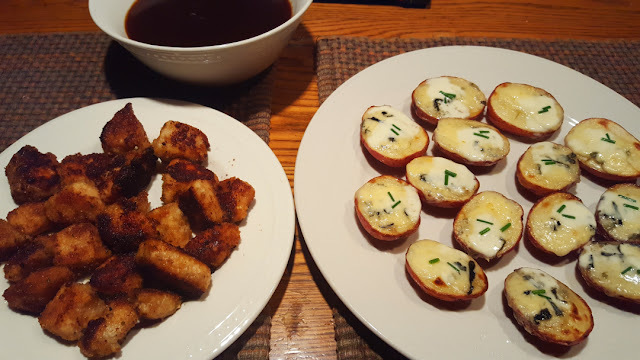 "Meat and potatoes" for dinner in the form of chicken bites (the ones I used in my Tomato and Bread Salad); and Roasted Baby Potatoes with Blue Cheese and Creme Fraiche. Alex made his secret rum barbecue sauce for dipping. How could I resist a red and white dessert? :) The strawberries are fresh, sweet and local, so I made strawberry shortcake for dessert. Doing a day of appetizers is a lot of work, but I really had a lot of fun in the kitchen. 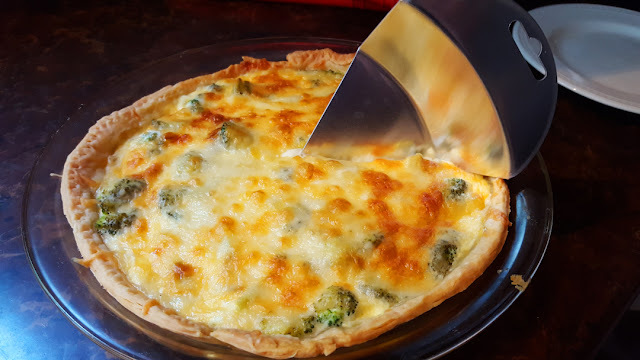 Yesterday morning I made a broccoli quiche for brunch. 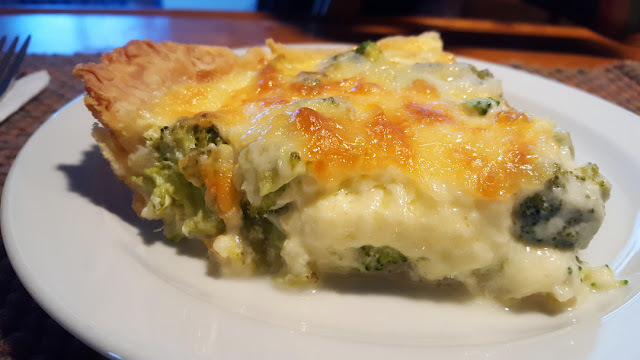 (It's the same recipe as my Asparagus and Cheddar Quiche, but with broccoli instead). This is another "keeper" recipe, it was delicious! Check out my pie lifter. I got it as an "add on" item when I made a purchase through Amazon last month. Add on simply means it's a real deal but you have to spend the minimum $35 for an order to get it so cheap. The idea of this pie lifter is that you bake it under the crust so that the first slice comes out perfectly. I haven't tried that yet, but it still works pretty well, though the handle could be longer. I had the other three dogs on leash while Alex gave the birthday girl her cake. She DEVOURED it! We had to stop her about a quarter in because she was loving it too much! 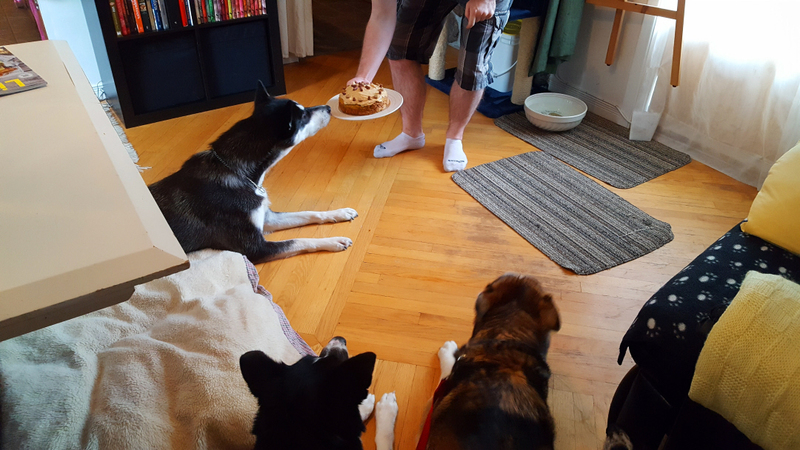 We shared the rest of the cake with the other dogs. Next birthdays are all three cats together in August. Keeping with the canine theme so to speak, we had what we call "European Hot Dogs" for dinner. :) This is Alex's dish. 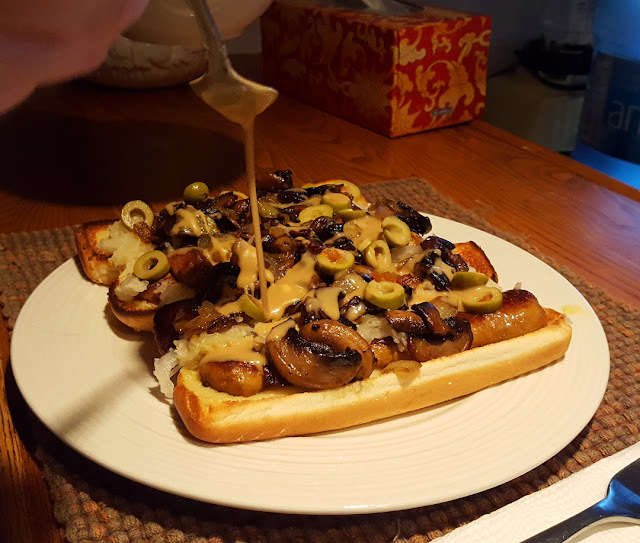 He cooks Italian sausages, layers them on toasted buns with melted Swiss cheese, then tops them with caramelized onions and mushrooms, sliced olives and a homemade honey mustard sauce. Delicious! 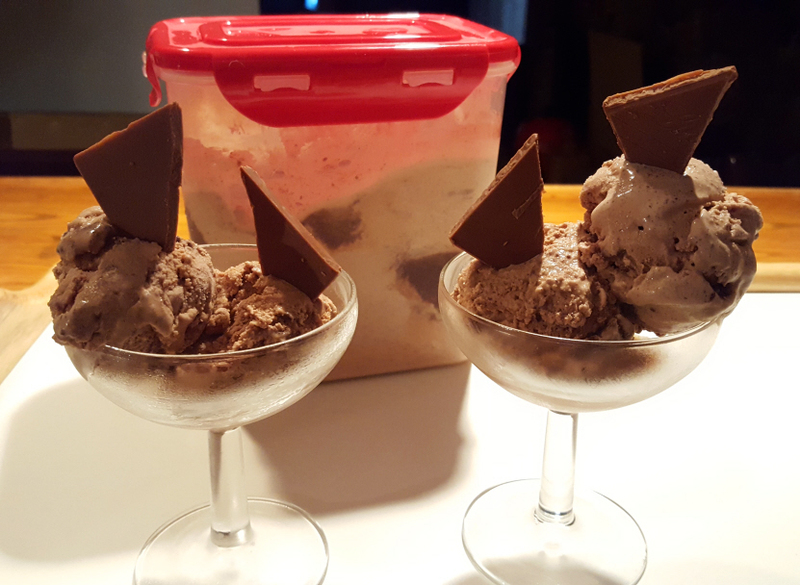 I made my Chocolate Fudge Swirl Ice Cream too! It was SO chocolaty...my only comment would be to make sure to really strain the ice cream very well before putting it in the ice cream maker. There were "crumbs" of chocolate, which was okay, but if you want a very creamy ice cream, double strain to get the little chocolate bits out. I'm sure Alex and I have gained weight during the last few rainy days what with me keeping busy in the kitchen lol...but this morning, we're FINALLY getting some sunshine! I hope my garden starts to grow again, it's been stalling for the last few weeks because of the rainy weather. Our cute little house guest Pavlov will be with us at least another week! :) His owner is having apartment trouble in Montreal, to that I say, no surprise. Montreal can have nice areas, but most apartments are crap and landlords don't care. When he saw the place it looked great. When the previous tenant moved out, there was water damage on the floor, holes in walls and mold. Poor guy, he has to get work done before he can enjoy his new home. I'm glad my city days and apartment days are over! As usual the food looked wonderful but I can almost taste the olives, If I only had some. Thank goodness I just ate breakfast or I would be drooling all over my keyboard! I love appetizers and yours looked so yummy! It is raining here and I cooked pasta primivera yesterday for the grandboys coming today. I still need to bake some cookies. Plus, there's always laundry and cleaning to do. I loved your Canada Day celebration...that's how I celebrate...good food, good companions and with me there is always some handwork involved and some t.v. That dog cake looked so good! LOL! Your pets are blessed to have you guys! Wish them Happy Birthdays for me! Wow, two days of terrific food feasting! Even the dogs! You know how to celebrate holidays! It looks like you all know how to celebrate! I haven't eaten yet today, time to do so! 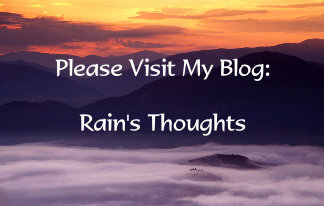 Rain, I had a wide, wide grin on my face all the way through this post. Would you (and Alex) please come live with us, cook and ply us with alcoholic libations? We have a large, well-established garden where you could also grow tons of wonderful food with which to create your culinary delights. You are somethin' else, my girl. A pure delight in the way you put so much effort into celebrating holidays. Maybe you could be our yearly holiday planner, also, so none of these important dates slip by us un-celebrated. Love the way you do it. I'm surprised your pup house guest is still with you. I have a feeling he would be happy staying right where he is forever. Your friend in Montreal is so, so fortunate to have you and Alex to dog sit for him. you guys sure know how to have a good time. the food all looks delicious. i love appetizers. i once threw and appetizer party and made 2500 apps for it. they are really a lot of work! your box should be arriving soon! Thanks Sam :) Pasta is a good idea for boys with hollow legs lol...the dogs are very lucky, they ate the entire cake lol...I think the only way to celebrate is a cozy time at home! Thanks Debra :) It was a great time for all of us! Thanks Tammie Lee :) This is what makes us happy, I just wish I had the energy to celebrate every day this way! 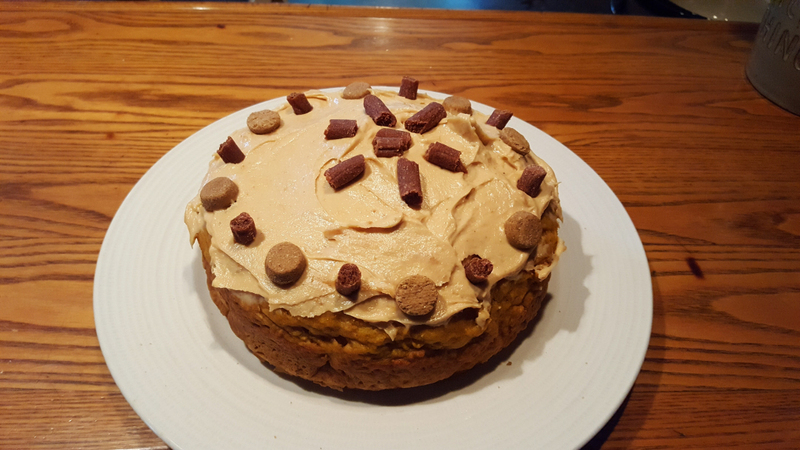 I think that Pavlov is one lucky boy to have us as his babysitters too...he even got birthday cake! What other dog can say that lol? Our friend is upset because since he came back from overseas, he's had to separate his two dogs, we got Pavlov and one of his other friends got P's mom Stella. We'd have taken her too, she's so sweet. He misses his pups and he's so peeved about being taken by the landlord...anyway, he should be ready for his dogs in a few weeks. We told him to take his time! :) I'm very attached to that little fella. I'm telling you Mama Pea...I would be a terrible influence on you if I moved there. We'd be on the porch all the time, working in the garden in the mornings, then sipping on cocktails, eating like "gourmands" and watching the boys work lol...and gaining weight! I'll tell you a secret, when I grew up, the holidays were forgotten or done half-*ssed, I haven't made it a secret that it was not a good upbringing, so maybe the child in me is compensating for missing out on all that fun stuff. I know Alex loves it, and I do too! It's a lot of fun! Hi Joyce! :) Oh I'm dying of anticipation for your parcel!!! We didn't have mail on Friday or today because of Canada Day so I've got my fingers crossed I'll have something in the box tomorrow! Why does it not surprise me that you made 2500 appetizers??? I can't even imagine it though! WOW! I want to eat at your place :) So much fantastic food. Even your animals eat better than we do...lol... I love appetizers. You get to eat a little of this and a little of that, which is a lot more fun! OMG those olives !!! Everything look delicious but they acctually make my mouth water. Oh man am I hungry now! Wonderful feast you put together and cocktails looked divine. Way to make the rainy days rock. I need to go back and look at those pics again! Thanks for the food shots. I think I especially liked the fried stuffed olives. I am sucker for olives and bleu cheese. The food looks delicious. Our dogs hate getting baths. King is the worst and he should love water, but he doesn't lol. Pavlov may never leave! 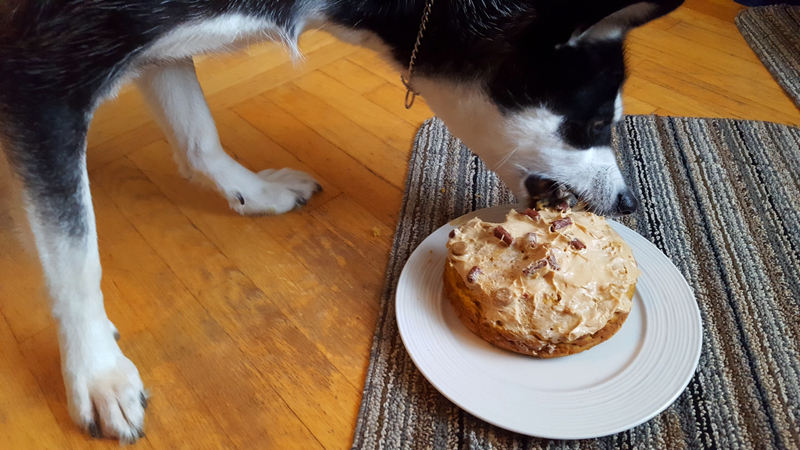 He got birthday cake! I have to say that your food is some of the best-looking ever! My god. If I lived there, I'd be whale-sized by now. 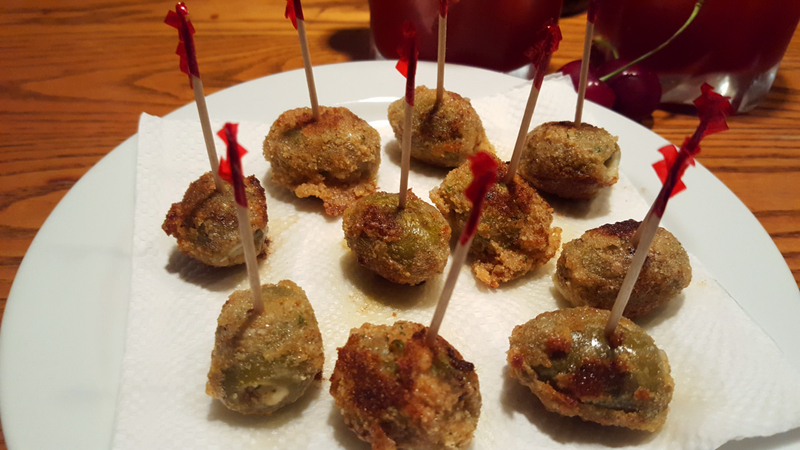 I like the fried olive appetizer - I am going to try it this weekend, just for little old me! I'm happy you had such a good day. I drink pickle juice so go figure...I don't think it's weird at all lol...I also eat sour cream right out of the container. Different strokes...as long as you enjoy it! Actually...Charlie is like your pups, she goes ballistic when we even look at the hook that holds the leashes...but the cake distracted her this time! The dogs do not enjoy bath time. Charlie tries her best to escape, but that's why we have the leash there, to hold her in the tub, but she'll jump into a freezing lake in March...she's special too lol. The others dogs aren't happy about bath time, but they tolerate it. 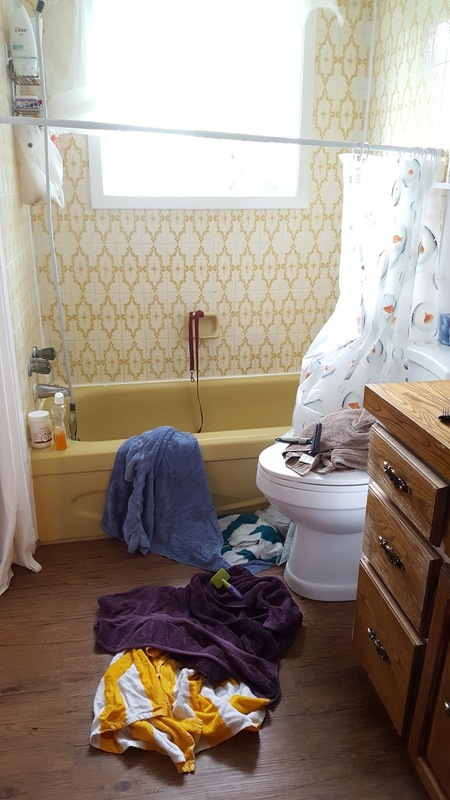 Mind you, as you saw by the shower curtain and overall disaster zone, they're always sure to leave their mark. Hi Kristina :) Thank you! The food is all gone now, as is the chocolate ice cream! That didn't last long. 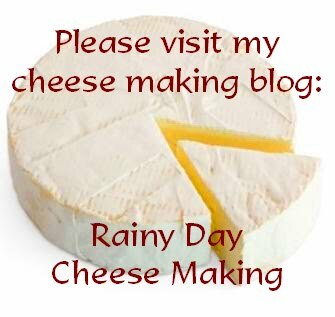 I have to make more. Yeah...Jack is like King, Jack IS a water dog by breed, but HATES getting wet. 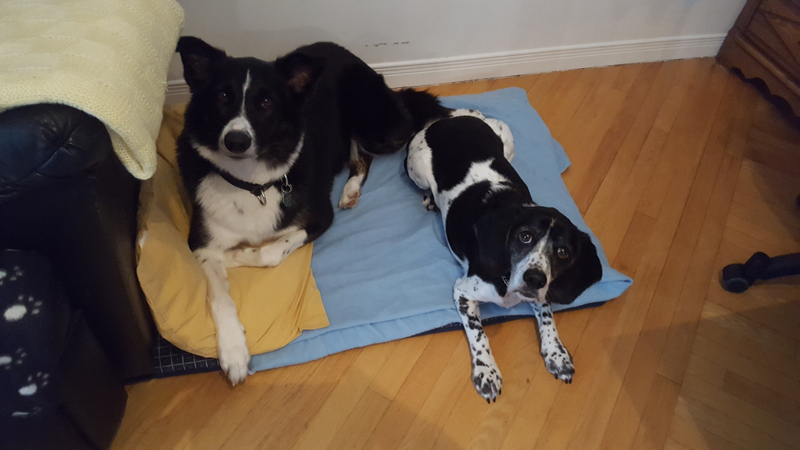 Silly dogs! Hi Susan :) I HOPE Pavlov stays!!! He's so sweet and cuddly...but I wouldn't want to deprive his owner. We don't mind that he's here on an extended vacation though, he's having a ball. He's so easy to care for too. I laughed so hard at your comment, the only thing keeping me from whale-sized is that we usually only eat one big meal a day! And the dog walks. Let me know how the fried olives go! Looks like a nice Canada Day...the food looks ahhmaaaazing! Goodies In The Mail and Cherry Bounce!